Chances are, you don’t know. 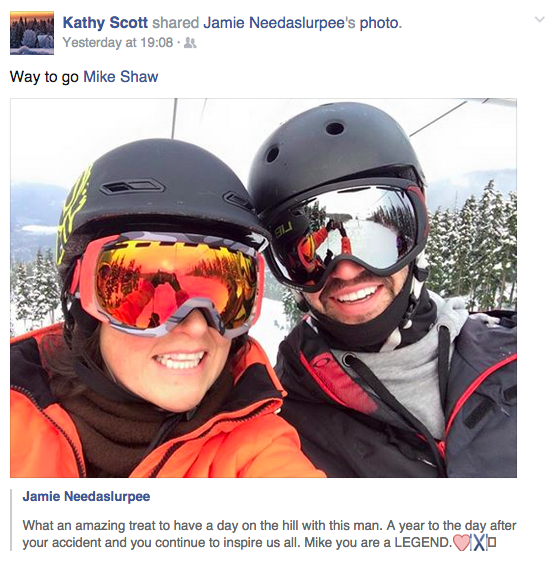 I mean, maybe you can guess – “it was a weekday but I was off, so I might have gone skiing”. Well, I can guarantee that your one year anniversary pales in comparison to Mike Shaw’s. 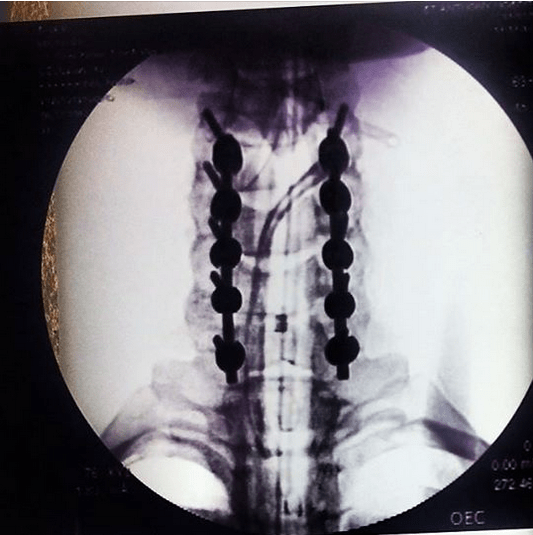 Last year, an all around good guy and ski coach dislocated his neck in a freak accident at Copper Mountain, Colorado. He was paralysed from the neck down, unable to do anything except scream, not in pain, but in the lack of it. With the help of some amazing surgeons, he survived, albeit with a long road of recovery ahead of him. That was December 16th, 2013. Shaw’s neck, with not many good things happening to it. A year to the day, this Tuesday, and Mike pretty much flipped the bird to his injury and went skiing with close friends on Whistler Mountain. The last time he stepped into his bindings was that life changing day at Copper. A positive guy with an incredible energy, Mike has inspired friends and strangers alike. When we spoke to him on the morning before uploading, he was nervous, but fired up. “It was a great feeling to have the muscles in my hand strong enough to do up my own boots”, Shaw explained. “That morning, I thought ‘this isn’t about going skiing. This is about recognizing my limitations, and striving to work toward skiing properly next winter. Keeping to my priorities like physiotherapy and whatnot. 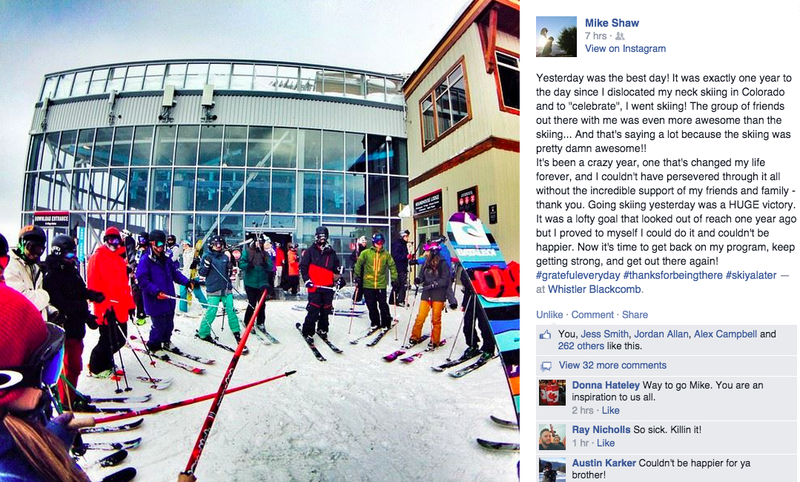 Quote of the day: “My friends are here, I’m back in my skis, the sun is coming out… It can’t get better.